I'm back home after today's tsunami scare. Fortunately the waves weren't as large as feared although there were surges in Hilo Bay as shown in the time lapse video below. Due to Hilo Bay's size and shape, a seiche will often occur when a tsunami arrives, which is the posh word for water sloshing back and forward in the bay just like water in a bathtub. It can increase the size of the waves as it has done in past tsunamis with tragic results. Well, I'm very relieved the waves were relatively small and my home is still here! To be honest it would have to be a massive tsunami to put my home in danger but you can't take chances so was happy to evacuate this morning. I would also like to say thank you to Frossie and Tim for their hospitality today in letting me (and the old girls) stay during the warning period and for a lovely lunch! I also had an offer of help from Jean for which I'm very grateful. What an interesting and extraordinary day, and I won't forget the sounds of the civil defense sirens for a while - the first time I've heard them go off in anger rather than just a drill. Also, please don't forget those affected in Chile by the massive earthquake that started all this. ...if I hide I won't be evacuated. Sorry, Eddie, it's the cat carrier for you. Evacuate or stay off the roads? You have to love the local TV news. With an approaching tsunami the KGMB news presenters have told us that we need to evacuate and get last minute supplies including gasoline (enough to last 7 days, which differs from the expert they interviewed just 30 minutues ago by about 6 days) while also telling us to stay off the roads. It seems I've a bit of hiking to do and need to lessen the weight. What do I drop? My hiking gear or the gas can? Or the seven days food I'm supposed to carry? I heard the civil defense siren. It was much louder than the tests although maybe that's because it's 6am and very quiet - the coqui frogs gave up hours ago. I have to admit it was an unpleasant sound and definitely one that'd attract your attention. The tsunami is now a little less than 5 hours away. The neighbours are packing and are prepared to leave shortly - as am I. The local news networks are going nuts with the news of the approaching tsunami and there's so much disinformation or complete ignorance that it's making my blood boil. The latest is that there will be a twelve foot-wave and given this is the home of surfers all that'll do is encourage the local surfers to go out and surf the tsunami. Don't do it. You'll die. A tsunami is not a wave - at least not the way you think of a wave. It's about 30 minutes before the warning sirens go off, they're due to start at 6am. I wont hear them because the nearest one is miles away but that doesn't matter. My car is fueled, I've packed enough gear to live for a few days and the cats are in easy reach - at least for now. Soon after that I expect civil defense and the police to come by asking us to evacuate. So I'm taking a shower now! The first waves won't get here for quite a few hours and I really hope that I'll be back here on Sunday moaning about the warnings. In any case, the first wave should be here at 11:19 am HST or about 9:20pm UK time. I'm getting things together and preparing to evacuate. I was planning to work in the garden on Saturday but think I might put that plan on hold for a day or two. ALONG COASTLINES OF ALL ISLANDS IN THE STATE OF HAWAII. 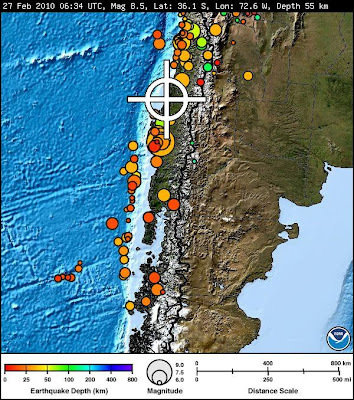 There's been a massive earthquake on the coast of Chile. It appears to have generated a tsunami. It might have generated a Pacific-wide tsunami. Reports are still coming in. The next few hours could be quite interesting. The sky looked a little different, almost like a watercolour painting. It would have looked even better if I was on the west side of the island with the ocean and coastline at the bottom, but I'll make do with this view from home! Click on the picture for a larger view if you want. I just got back home after finally watching the new Star Trek movie. OK, I know it's not new anymore, it was released ages ago, but I've never been a big fan of science fiction. True, many astronomers watched the original Star Trek series as kids, as did I, and I enjoyed it in those days. Hey, I was eight or nine years old then! I've never really enjoyed the whole premise of science fiction though, especially Star Trek, because more often than not the stories show the crew ending up in some predicament which is solved by fictional techno-babble. Let alone the fact that they only got into trouble in the first place by some inconceivable violation of the laws of physics. But it doesn't matter, it was just a TV show after all. I have to admit, though, that Star Trek, the latest movie that is, is brilliant! You can put away all that trekkie stuff, the utopia Roddenberry envisioned, and just enjoy it as a wonderfully entertaining movie! OK, the story is a little mystifying, especially to an astrophysicist, but I watched it all the way to the end and is something I rarely do with any movie - science fiction or not! My only complaint? Why so much lens flare? It detracts from the movie quite badly in my opinion. It's very distracting. So, my answer is to show a little lens flare myself. It's tourists just outside UKIRT last Tuesday night who took up my usual photo spot. Sometimes I wish I had a photon torpedo or two but we keep those locked up for emergencies. Another picture of a volcanic or lava bomb. This was from the same bomb field I wrote about the other day. The place is a geologist and volcanologist's dream, there are so many different types of rocks on the ground including a type of rock I can identify without looking it up - pumice. 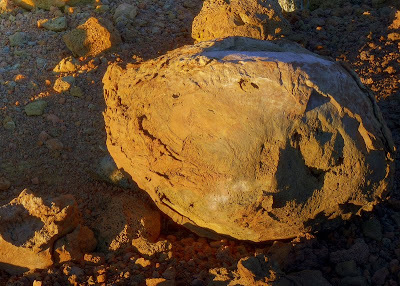 That's the bubbly type of rock you can see in a few places on the ground. 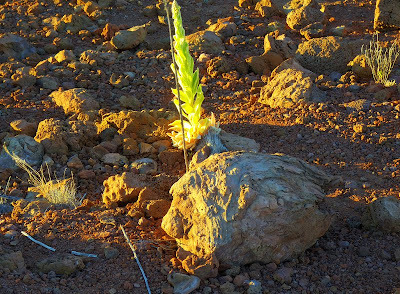 Like the bomb, pumice tends to be formed in violent volcanic eruptions. It's "frothy" molten lava that has a high gas and water content and when ejected in an eruption cools rapidly trapping the gases inside and forming "bubbles". The rock can be so light that it can actually float on water! The ridge just to the east of Hale Pohaku is a bit of a mystery to me. Although I've known it was there for years I never bothered to walk up to it and have a look until now, but it has black sand, lava bombs, pumice and rocks that look as though they experienced some violence in the past. I'll try to find out if there's more known about it because it's certainly attracted my attention for now - speaking as a scientist of course! One mystery is where the violent eruption took place. There's no obvious crater nearby but then again volcanic bombs and pumice can be hurled miles from the eruption site, so that brings a lot of possibilities into play. Just up slope, though, there's no obvious candidate. Hey, me and my shadow! (to the bottom right). Corinne Bailey Rae singing "I'd do it all again" from the album "The Sea". She is going to be a star and I can't stop listening to the album. Jeeze, that's a mouthful. Still, the visitor center does wonderful stuff and I'd encourage anyone on the island to visit if they can, especially at sunset and afterwards when the volunteers will show you the night sky. Even during the day they have a telescope trained on the sun. 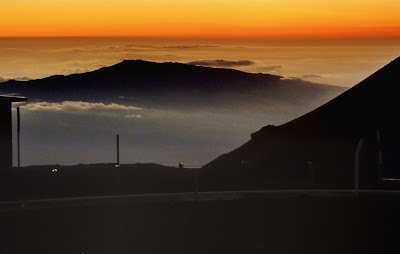 The picture was taken from the lava bomb field to the east just after sunset. The parking lot is full so cars are parked on the side of the summit access road. In the next hour the place will become even more crowded as the tour buses arrive from the summit and disgorge another couple of hundred visitors. The night sky from this level is more spectacular than the summit unless you happen to be a piece of electronics. At 14,000 feet the night sky is wonderfully clear but your eyes don't work that well due to the lack of oxygen. 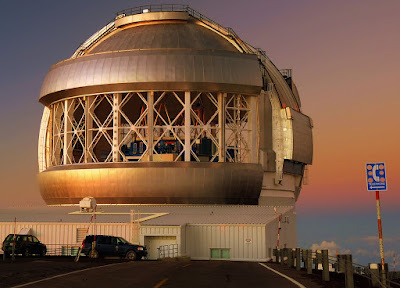 At 9,000 feet though, your eyes work quite well and you're still high enough to get a remarkable view of the night sky away from the clouds down below and any light pollution from Hilo, Kona, Waimea or elsewhere. For anyone interested in astronomy and also happens to be on the Big Island, you should make a visit to the visitor center a priority. Sorry, should have given a link the place. It's http://www.ifa.hawaii.edu/info/vis/. 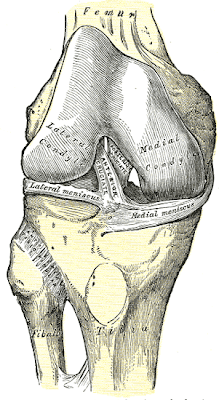 Does anyone have a spare knee? Preferably a left one but I'll make do with either. One of mine is on its way out and I need to find a replacement. I'll pay for the postage. On Wednesday evening I made a short hike to a lava bomb field a few hundred yards from our accommodations on Mauna Kea (HP). The deep fried chicken and fish weren't very appetising (or tasty) but I had to eat something. I decided to walk off the cholesterol. At the summit we get a great view of nature but I've only tried once or twice to picture things from HP. It's a place to try and sleep between very long work days/nights and not much more. So, how many things are in the picture? 1) To the extreme left the clouds are being blown into the saddle by the low-level trade winds but can't get too far because there's not enough moisture in the atmosphere. 2) The high level winds are different and opposite. 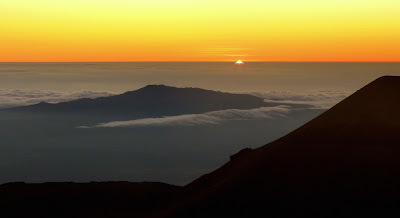 Cirrus clouds can be seen to the south above Mauna Loa. They are being driven there by the jet stream from some impossibly powerful thunderstorms to the south. The storms are generated in the Inter-tropical convergence zone (ITCZ) and the tops of the massive cumulonimbus clouds are blown towards the islands. 3) Left to right - cinder cones mark volcanic eruptions in the last few thousand years. In fact the place I'm standing on to take the picture is strewn with lava bombs and was clearly a place to avoid in years past. 4) In the background - the Mauna Loa volcano and its summit to the far right. A few years ago all the indications pointed to a new eruption but in the end it didn't happen. It's fairly certain we're just buying time because Mauna Loa erupts every decade or so on average. It last erupted in 1984. 5) From about the middle of the picture to the left you can see some haze. That's vog or volcanic emissions from Kilauea. 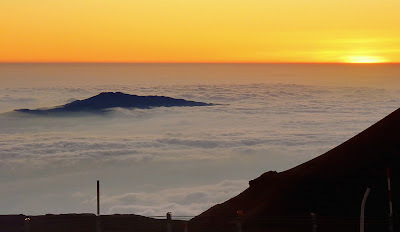 It tends not to get above the inversion layer which is why it looks like a band across Mauna Loa. On the odd occasion it can get to summit level, or 14,000 feet, but that's rare. 6) The vegetation in the foreground is at its limit. Behind me the so-called tree line begins. Although you can find the odd plant above this altitude the green plants are at the edge of their universe. I'm saving the good title for when I finally get the panorama I want. This isn't it but it's getting there. This was taken on Tuesday evening and hoped to learn a few things for Wednesday night but I broke the telescope so that didn't happen. The day crew went up and tried to fix what I'd broken but the winds were too high so I got to spend the night at Hale Pohaku. OK, day crew, you made your point, you win! I won't do it again. On Thursday evening, before sundown, I went back to the spot to try once again what I described in "Maybe this week I'll nail it". I now have about 70 pictures and thought I'd covered all bases when it came to making a panorama in difficult and changing light conditions, but no luck so far. The software (Hugin) either deals with the light and gives crazy and disjointed looking pictures or gives a great panorama that looks as though someone screwed up their jigsaw puzzle. I promise to get it right one day. Next time I'll turn off the automatic colour-temperature setting in my camera because I think that's what got me on Thursday night. All - thanks for your comments in recent posts, I'll respond to them over the weekend once I get over mountain lag. The winds relented last night and today which allowed the engineers and technicians to fix and test our dome shutter which is now working again, as the picture above shows! (Complete with moon). Unfortunately the winds have returned this evening and with a very cold airmass over the mountain standing outside at sunset was almost unbearable unless you could find some shelter from the wind. Since the wind was almost directly from the west that meant anyone wanting to watch the sunset would have to bear the full force of the wind - I think I stuck my head at from the sheltered side of the dome once or twice to take the snapshot below since the clouds and vog around Hualalai looked interesting, but then it was back into the warmth of the control room for a nice cup of tea. a) The first corollary to Murphy's law: Anything that is to go wrong will do so at the worst possible moment. b) The unspeakable law: As soon as you mention something, if it's good it goes away, if it's bad it happens. Well, I can certainly blame Andy the e-Astronomer who, in his recent post "Emmets at Sunset" wrote "UKIRT was always ground breaking and world leading, but now it is a kind of flawless machine as well." Literally hours after he had posted this we broke UKIRT, and at the worst possible moment. High winds meant we had to close the dome at around 3:30am last night but it wouldn't close. After many attempts and a lot of swearing we managed to get it closed and safe but at the expensive of pulley cable and a nasty feeling we might have done further damage. Today the engineers went up to fix the problem but since it involved opening the dome to test their work and the fact that winds were gusting over 50 mph, they were unable to complete the fix and so we are closed tonight and I get to stay in my favourite place in the world for the night - Hale Pohaku (HP) at the 9,000 foot level of Mauna Kea. (Yes, I'm being very sarcastic). So Andy, you owe me a beer! A lava bomb. These are formed in volcanic eruptions when a blob of molten lava is expelled from the crater high into the air and cools rapidly as it falls to the ground where it lands in a very hot but fairly solid state. You don't want to be underneath one of these! The area east of HP is strewn with them and it makes walking difficult - no admiring the view while moving! A little later looking to the east and Hilo, which is hidden behind the slope. 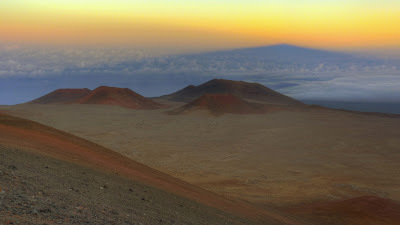 The sky is becoming dark as the sun sets and the shadow of the earth is plainly visible above a distant cinder cone. 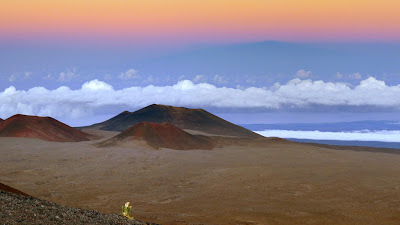 The summit of Mauna Loa with vog in the valley. I have no idea what this building and surrounding fencing is, I have never seen it before! It's just to the west of the Visitor Information Center and out of site from there I believe - I certainly didn't know it was there. An electrical substation? Not one of the prettiest sunset I've seen but nice nevertheless. Again the lack of high clouds meant the sunset wasn't as spectacular as those we were getting this time last year. I caught the sun just as it set behind the distant clouds to the west. Subaru also put on a bit of a show with the last rays of sunshine falling on the dome and surrounding structure - it looked quite pretty! You might think the clear skies would be good news for us, but we've had an interesting night so far. There is a trough to the north of the island which is causing high summit-level winds so we are trying to point away from the wind and let the dome shield the telescope. This limits our options as to what we can observe. To make matters worse, the trough is also increasing winds aloft to something like 150 mph and we are seeing a lot of turbulence and shear in the atmosphere. This degrades the image quality (seeing) significantly. By this time of night we'd be hoping for 0.5 arc second seeing but we've been getting more like 1.5 which is pretty unusable for us. Having said that, we seem to have just found a patch of sky which isn't too bad, so at least we're getting some useful science done. This is really frustrating. I've been trying to take a panorama of Mauna Kea's shadow and the summit itself. It takes several shots because we're talking more than 90 degrees here but it is very challenging. When the shadow appears the light is changing rapidly, as is the shadow, so you have the take all the photos very quickly and in low light that is difficult enough. I'm also trying to take at least two photos in each spot to capture the dark and bright spots and it's harder than you might think. So far I haven't succeeded and have also managed to find some bugs in the (cheap or completely free) photo software I have - I'll try not to put my fist through the screen. The picture above is the latest attempt but you can see the seams and all sorts of weird effects and it's driving me nuts! Being called to the front desk - Uh oh! It was Friday, late afternoon at around 4pm. I was starting to get my gear together because it's a holiday weekend with Monday being President's day and wasn't planning on being back in the office until late next week. I'm back on the summit during most of the coming week so was packing my laptop and all the other little things I need. Then the phone rang. "Tom, can you please come down to the front desk now?". At least it wasn't announced via the PA system. "Oh no" I thought, "what have I screwed up now?". I did have a few admin tasks to do last week plus a booking I'd made for HP on the mountain. One of the staff I supervise was sick so it could have been that as well, perhaps I'd done something wrong on the time sheet? My passport is about to expire and I'd sent off an application to the UK embassy so perhaps it was that - did I screw the form up as well? Being asked to the reception area late on Friday afternoon means something has gone wrong and the admin people want to fix it before the weekend. "OK, I'll be down in a moment, what have I done wrong?" No answer. Now I'm worried because when I get down to reception most of the admin people are in the corridor waiting for me. I really have done something bad, haven't I? Did someone see me take a soda from the fridge and not sign for it? Honest, I've signed for every soda I've taken! Then I see what they're all fussing about. A big box with flowers in it addressed to me. This is when my face turns bright red and wonder if the sender could have perhaps sent the flowers to another address! The next few minutes are spent opening the box in front of my friends and colleagues while fighting off the ones that tried grabbing the card that came with it. That's kind of personal and I'd like to read it alone! Over the next half hour or so I suspect all the staff in the office heard the story because I then had to fend off all the visitors to my office. Those admin people really know how to gossip - and do it quickly! The flowers were from Pam. This winter is certainly turning out to be unusual thanks to a relatively strong El Nino event. This time last year we had snow, ice and howling winds at Mauna Kea's summit and this year all there is to report are some high winds. The picture above was taken a couple of weeks ago and shows what look to be some threatening clouds just below the summit and high cirrus clouds capturing the light from the setting sun. The low-level clouds never got to summit level and the high level stuff drifted away leaving us with another beautifully clear night. Some of the telescope operators feel that they're working overtime this winter - long winter nights are hard to start with but usually there's some compensation as bad weather wil often cut the nights short. Not this winter! Left to right in Submillimeter Valley - the CSO, JCMT and the SMA. Click on the picture for a larger version. My new camera comes with a new feature - high dynamic mode. Just to be clear, the new camera is the same as I had before except it has a couple more features and the sensor is a little bigger. I was thinking of splashing out on a decent DSLR before Christmas until the world came crashing down around me so just went with something I knew and didn't cost very much. I have to admit I don't understand the new high dynamic range feature. I know what it means - the idea is to capture both dark and bright light in an image that sensors can't usually handle, but I don't know how it does it. I guess I should do a little reading! What was really disappointing though is when I switched on the feature the camera's software took control of everything including ISO, exposure time and aperture and I could do nothing to change them. Seems I'm stuck with ISO 400 and the subsequent electronic noise. Oh well, not a big deal, the camera still lets me set things manually as long as I don't use the new setting. 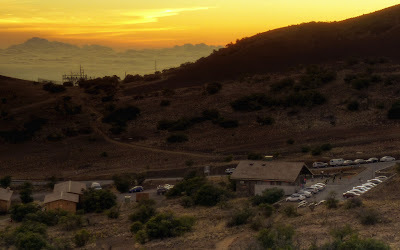 This was a picture I took from HP (9,000 ft level on Mauna Kea) a few days ago at dawn using the high dynamic range setting. It's hand-held because I was just too tired to get the tripod out - it was time for bed! Just right of centre is Pu`u O`o which has been erupting since 1983. It's a long way away! 12 hours earlier I took this photo from just outside UKIRT well after the sun had set. It was about the only place I could find out of the wind which was very strong. Since it was getting dark I had to use a long exposure so finding shelter from the wind was important - anywhere else would have resulted in one very blurry picture! Finally, late at work today the admin staff found a great way to embarrass me. I need to pay them back and soon! I might write about it soon but in the meantime I hope everyone has a wonderful Valentine's weekend! Just a few more pictures from Sunday night (click on them for larger versions). 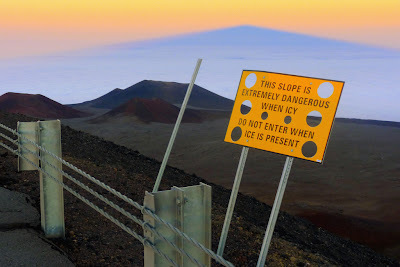 I was looking back at some of the pictures I posted from Mauna Kea's summit early last year and it's very clear how much of an effect El Nino has had this winter. Since the new year the skies have been clear and observing conditions mostly excellent which is unusual during the winter. There's been little if any snow and the high clouds that allow for those dramatic sunset shots simply haven't been there. Just outside the UH 88-inch looking east. The shadow of Mauna Kea is weakening because I got there a bit late! Hilo Bay is visible to the centre-right of the photo which is unusual in the evening as more often than not the lower level clouds have built up so much during the day they hide the east coast. Just another sign that the weather conditions are unusual. We often get a clear view of Hilo and the windward side when driving down at sunrise because the clouds dissipate during the night. Seeing the bay at sunset is rare. To my left was Gemini - fully open and venting the dome to ensure the best chances for excellent image quality during the night, especially during the first couple of hours. It also has a telephone. The wonders of modern technology! (Actually, the sign points to an emergency telephone in the UH 88-inch observatory). After the sun had set I took a couple of photos of the big guys to the west. Subaru, to the left, captures the last few rays of sunlight and has a golden glow. Keck I is to the right. 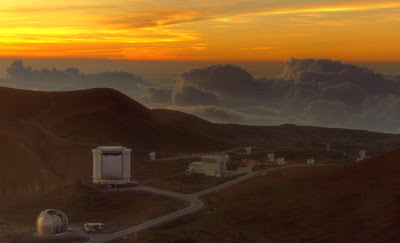 Left to right, Keck I and II with Haleakala on Maui in the background. Keck II just started to open the dome as I took the shot. It was a windy and cold evening, my fingers were numb when I went back into the "office" to start work for the night. I'm surprised the shots are as sharp as they are because I could see the camera and tripod wobbling in the wind. That's technology for you, the camera actually corrected for the vibration, even in a cheap camera like mine! I've just heard a rumour that Top Gear is being dropped by the BBC. Surely this isn't true? I'm not a vintage or sports car person but it was one of the most entertaining programmes the BBC ever ever made with no holds barred opinions. This is the end of civilisation if true. The next thing I'm going to learn is that the BBC no longer broadcast the England cricket team playing test matches at home. That won't happen in a million years though, the whole country would be in uproar. Yes, I know, it's one day cricket but I couldn't find a better version of Soul Limbo. You know the more frightening thing? I can probably name all the cricketers in that video - batsmen, bowlers and fielders! Another photo taken on Sunday (Super Bowl) evening but this time from inside UKIRT's dome. It shows the revolutionary UKIRT Wide Field Camera (WFCAM) sitting atop the primary mirror (the mirror covers are closed unfortunately). 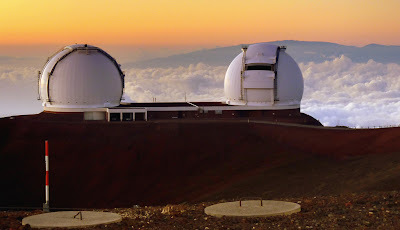 The picture was taken during sunset - the dome slit is open as is the dome ventilation system (DVS). This allows the dome too cool down rapidly and equalise the dome and atmospheric temperatures for when observing starts. If this isn't done, thermal currents from the warm structures in the dome destroy the superb image quality the UKIRT usually enjoys. The photographer in this case wasn't me but a very good friend of mine, Paul Hirst, who is using WFCAM as I write this. Paul used to work at the UKIRT and in fact commissioned WFCAM in 2005/2006 before moving onto Gemini (and leaving me with far too much work to do as I took over responsibility for the instrument among all my other duties!). He owes me a beer or two, but please, not Bud Light! 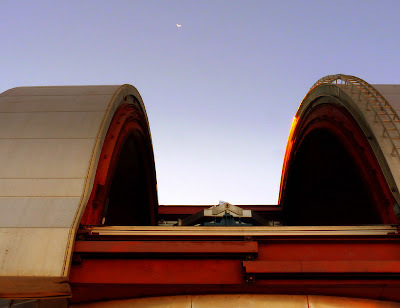 Paul's current employer operates the telescope to the right in the picture below. Since he was taking a picture of the UKIRT I thought I'd take a picture of his workplace at the same time! Andy Lawrence, otherwise known as "The e-Astronomer", takes over at the UKIRT tomorrow night and will continue to observe for a few more nights. Both are taking data for the UKIRT Infrared Deep Sky Survey (UKIDSS) of which Andy is, coincidentally, the principal investigator and the survey WFCAM was designed, built and commissioned for. What a small world! I mentioned it in my last post, but there are so many inaccuracies it's hard to know where to begin. The most fundamental one is that I know no astronomer or astrophysicist who drinks Bud Light. We are a strange community but I can tell you that most astronomers know their beer! PS. We also know how to spell asteroid! I managed to watch the first quarter of the Super Bowl before leaving for the summit and with the Colts up 10-0 thought I was going to miss a bit of a blow-out, so wasn't too concerned. By the time I was at the summit the news was the Saints had won in a very entertaining game! Oh well, we all have to make sacrifices although I did manage to see the Bud Light astronomer advert which reminded me I have to buy a white lab coat one day and wear it at the summit! 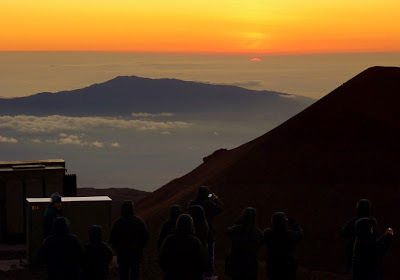 Lots of tourists also missed the Super Bowl but by choice; they were at the summit on Sunday evening watching yet another magnificent Mauna Kea sunset. The picture is a blend of two photos, one with a short exposure to catch the bright sky and a slightly longer one to capture a group of tourists below me watching the sun sink behind the clouds thousands of feet below us. (Click on the picture for a larger view). Unfortunately we're not allowed alcohol at the summit, so no Bud Light party for us when it got dark. Oh hell, what am I saying? Bud Light? I'd rather drink urine. 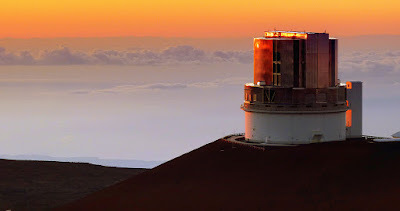 One of my duties as an astronomer working at an observatory on Mauna Kea, Hawai`i, is to give support to visiting astronomers from around the world who use the telescope. In the last three or four years we've moved into a survey mode which has changed this role quite significantly. In the old days, astronomers would prepare their observations a few weeks before visiting, perhaps even a couple of days beforehand when they arrived on the island, and we'd help with the preparations using our knowledge and experience of the instrumentation and telescope. We'd then accompany them to the summit, help them observe for a night and then provide help and support remotely by telephone and email for the rest of the run. Often, we'd help with the data reduction after the run and sometimes even the analysis and on occasion get so involved in their project we'd end up as a co-author on the resulting publication. 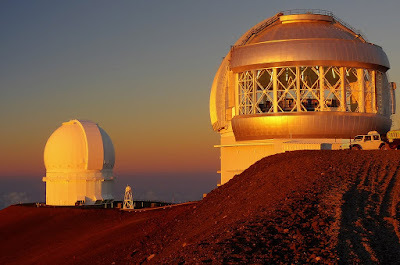 These days the observations are planned and the relevant scripts are written months ahead, often automatically, by the survey team and the astronomers that come out to do the observations more often than not are there to observe something they have not prepared themselves. After the observing run, the data are reduced automatically and sent to an archive where more automation creates catalogues and reduced data. It's a much easier job these days, I can tell you! On the other hand, I miss the old days. It was far more satisfying to work with an astronomer or a team to get everything out of the instrumentation and telescope that they needed. It was a lot more work but always pleasurable. Then again, I often support survey observing runs with the most interesting people, and Friday night was no exception. It was one of the most pleasurable nights I've spent on the summit in quite some time! I'd only met the observer once before, just a few months ago when I took a tour party to the summit. That's strange enough because 1) we both used the same instrument at the UKIRT to obtain the data for our PhDs, 2) he was, in the past, a regular visitor to the summit to use the instrument I was responsible for and 3) we both got into the career at around the same time in the UK and we both have the same colleagues and friends. We just never happened to meet. So on Friday night I was up on the summit with him and we had the most enjoyable chat; reminiscing about old times, current events and the future. 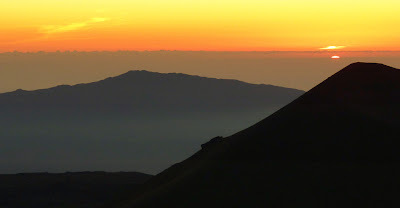 Just before sunset, as the dome is cooling and there isn't much to do until the sky is dark enough to start observing, we took a gentle stroll around the summit while chatting about all sorts of things. We walked up the summit road to watch the shadow of Mauna Kea and it was one of the clearest I'd seen. Because I knew I'd be busy around sunset I didn't bother to take a tripod with me, no time for spectacular photos on this evening (and the sky was clear which is great for astronomy but not so good for photography) so just took the odd handheld shot of the scene plus a few photos for our visitor's children. As we wandered slowly back to the telescope I looked back and one or two tourists were clearly interested in what we were looking at. 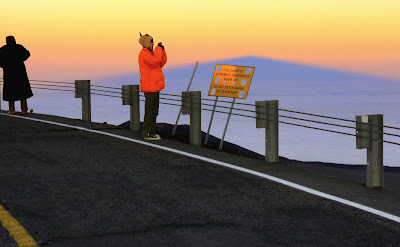 The bright orange-jacketed one was taking a picture of the true summit to the right while the person to the left was admiring the shadow of the mountain and of course the earth's shadow on either side. It was getting close to sunset as we got back to UKIRT so we visited my favourite photo spot to watch the sun sink into the distant clouds above the Pacific. No green flash again. I think I'm destined never to see it from the mountain. The view was nice though with Hualalai and the slope of Pu`u Poli`ahu silhouetted against the bright sky to the west. That was it, time to get back inside and start working. The first night of a run is always busy as there's much to teach the visitor about how to do the observations and how to use the observing software. Although we've made the software very easy to use, you always have to remember that people are working at night and at an oxygen-deprived 14,000 feet so efficiency is reduced, often quite dramatically. The next few hours after sunset on a first night are often quite busy! Although not taken on Friday night (this was taken on Sunday evening well after sunset during my last stint at the summit) this would have been the view outside had we spent a little longer in the freezing temperatures. Gemini to the left and the UH-88-inch to the right starting their observations for the night - the sky is just dark enough to find some stars and start working. The shift won't be over for another twelve or thirteen hours. Well, it's time to check in with the summit to see what's going on - that's part of the support job. We have all sorts of displays online so I can tell very quickly how things are going but there's nothing like getting the news directly from those on the summit. It'll be good to chat with our visitor again as well! We'll repeat this on Saturday night and then I'm back at the summit again supporting another visiting astronomer - this time a very good friend of mine and a damn good photographer! That should be another fun evening at work! PS. Remember you can always click on the pictures to see larger versions. What did you do to my office? I came into work today and found I had a little surprise waiting for me! This was due to the news about Pam which she explains in "The Big C vs. My Surgeon". I have to say that I work in a wonderful place with wonderful people. Where's that bloody laser beam then? 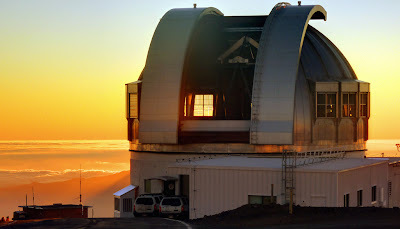 On Sunday evening at around 9:30 we called the Keck observatory to see if they were using their new laser on the Keck 1 telescope. I'll admit it wasn't a purely professional call, I wanted to go outside and take a picture! The answer was promising, the laser was in action (for PC reasons, I'm supposed to steer clear of using the term "firing off the laser"!). It was a beautiful moonlit evening so I set the camera up on a tripod and took a couple of 60-sec exposures to create a panorama. I couldn't see the laser beam with my naked eye but that's not unusual, the lasers that Subaru, Gemini and the Kecks use aren't actually that bright and are only obvious if you know they're being fired, oops, used, and know where to look. A long exposure photo will, on the other hand, make the laser beam look very bright. So, why is there no laser beam in the picture above? Three possible reasons: 1) they lied to us, 2) they turned off the laser just as I took the picture or 3) it's just so faint that it's not even visible on a long exposure photograph (the laser on Keck 1 is actually quite a low powered one). Andrew needs to explain! He was up there that night. Still, it's a nice panorama of the summit at night lit with a nearly full moon. 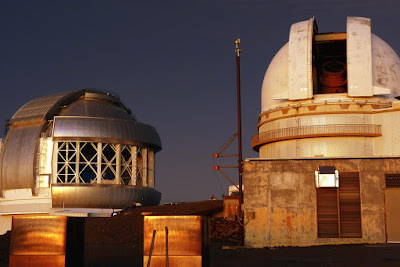 At the bottom centre you can see the shadow of the UH 88-inch telescope and to the right the shadow of Gemini. I had a wonderful telephone call this afternoon. It's difficult to describe how happy I feel and what a weight has been lifted. Pam can explain in her own words! I know it's out of focus but anyone care to guess what this is? It's not as nasty as it looks but will take a bit of cleaning. Brian and Kevin got it right, Hilary was very close and Alice, you need to know that I don't drink coffee! Can't stand the stuff. As a Brit I only drink tea but you have me interested and I think I'm going to try and find out what a frozen tea splatter looks like! A year ago I would have been so proud of the picture above. Now it's well down in the list of my pictures I think are good - there's that slide show of mine which resulted in the most wonderful feedback and it won't be in there. Then it struck me. I'm trying to be a perfectionist. The picture isn't so bad after all! The odd thing is that I don't think I've ever tried to be a perfectionist until the last two months. In that time I've been told that I'm facing redundancy and the most important person in my life has cancer. I can't put two and two together and make four, I think I make it five or three or perhaps two-and-a-half. There are just too many things going on right now for me to make sense of them. Tonight, a close friend and colleague lost his father. Too many bad things are happening at once. Keera, another friend, is also facing a difficult time. Hopefully things will even out soon and those I care about will be around to tell stories of their eventual success. I know Pam will be and I'll be there to make sure it happens. The moral of the story? I'm not sure I have one and even if I do, I'm not of the right mind to comprehend it. Perhaps in a few months or so when I can post something about the treat lady (Pam) arriving back in Hawaii I'll have a better idea of what I want to say. I hope so because even I can't make sense of what I'm writing, I just need to write it. Pam gets her pathology report tomorrow (Tues 2nd) and she's scared and nervous. So am I.
Oh, it's the shadow of Mauna Kea with a sort of anticrepuscular ray combined with the earth's shadow and the eastern flank of the mountain with its cinder cones. It was taken on Sunday evening so too late for the slide show anyway!